Tony Lossano, etc. 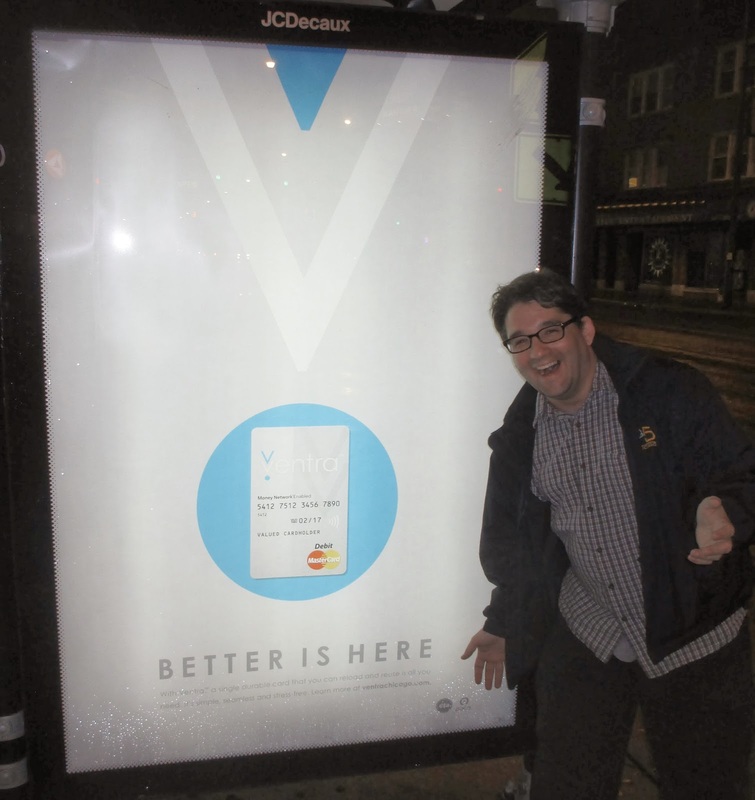 : Ventra, On The Wrong Track! 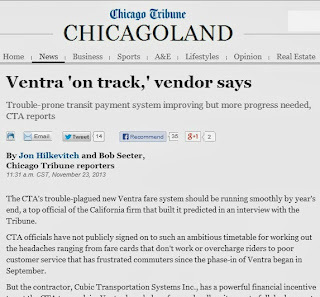 Today's Chicago Tribune has an article, regarding Ventra, reported by Jon Hilkevitch and Bob Secter. Better Is Here? Ha ha ha ha!!! Yeah, Ventra may be on a track, but it is still like a runaway train! It was suppose to be running smoothly during this past summer. $2.5 million a month, a bottom line figure that could be hard to reduce regardless of future problems. Once Ventra is in full control, not much can be done with them? The publicized schedule was always to start in the summer, which we did, and complete by the end of the year, and we still think we are on track. Um, no, things were NOT on schedule. Remember, Ventra cards were not even sent out until AFTER autumn began, which the publicized schedule said that they would have been received as early as August. first-of-its-kind experiment in the U.S. to outsource fare collection. This is being forced upon the public that didn't want it. increasing customer confidence in the system, saying that nearly every day the total amount of money loaded onto Ventra cards increases. Once people switched to Ventra, with many ongoing issues, I would EXPECT that their fare cards would be reloaded with more funds. This is expected. This is NOT a sign of confidence. You still have to earn that. The number of calls to the Ventra customer call center has declined about 10 percent from October to this month. Once the enforcement to switch over was lifted, I am sure people are just waiting for things to get better before needing to call in to customer service. Watching the Ventra reader on an empty bus. 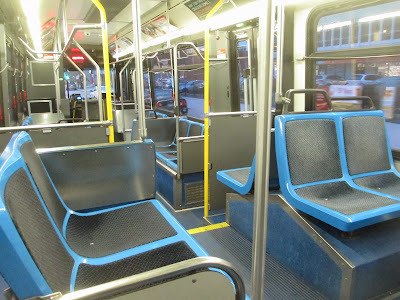 a finicky tap-and-go boarding system as well as better performance from malfunctioning fare equipment that has overcharged a number of CTA riders. Yeah, and the CTA gets to fine Cubic, but it's actual customers get screwed. Reporting error, as Chicago Cards never had magnetic strips. Another condition requires Cubic to demonstrate that an average 85 percent of fares were paid for with Ventra cards for at least 90 consecutive days. Why is an outside firm that the CTA is paying, under the gun to convert a majority of CTA customers to this debit card? Cubic can also make money off the controversial debit card function of Ventra cards, with the company and CTA agreeing to an even split of debit card fees. Yes, make lots of money from fines on a service that people depend on to get to their low-income jobs, while generating even more income from government funding and grants. Quicker boarding on buses and at rail stations was one of the major benefits that the Ventra system was supposed to deliver. 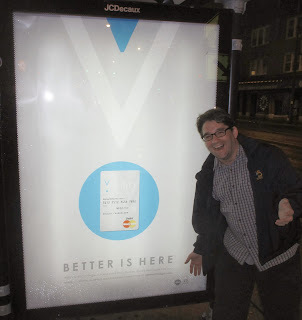 The Chicago Card is still faster then Ventra, so "Better Is NOT Here!" Claypool's mandate of a maximum 2.5-second tap speed for each Ventra transaction is antiquated by current industry standards. 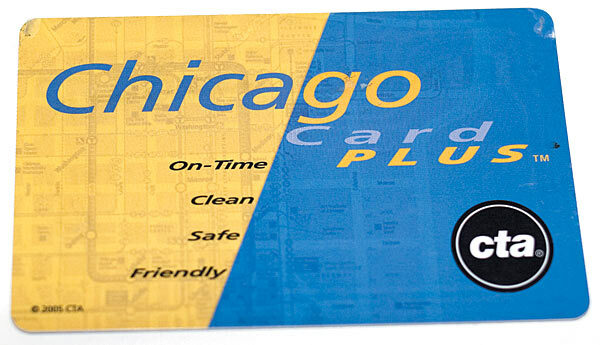 Did I mention that the technology that the CTA is replacing, is FASTER than this new, so-called, better card? 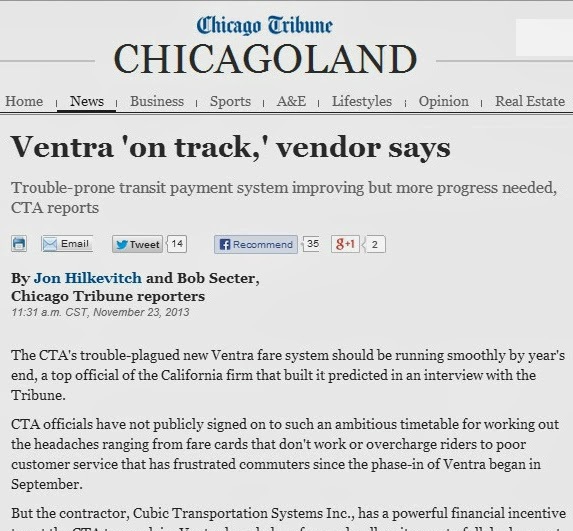 the CTA/Cubic contract requires the average processing speed for a Ventra tap to be no greater than one-half second. Kinda like the Chicago Card, which Ventra still is not that fast. a three-day snapshot taken from Tuesday through Thursday — showed that 59 percent of the more than 2.8 million Ventra taps on the CTA rail system took ahalf-second or less, 35 percent took up to 1 second, 5 percent took up to 2.5 seconds and 0.3 percent took more than 2.5 seconds. On what planet was this test done??? Those numbers do not reflect anything that bus riders witness themselves, as we all see each new customer come aboard and wait for the card reader to process the Ventra tap. CTA officials acknowledged that tap-speed performance on buses was much worse, but the transit agency only provided data for approximately 200 of the system's more than 1,800 buses — about 50,000 taps. The Ventra card readers on those 200 buses have received software upgrades while the remainder of the fleet is awaiting the new software patch, officials said. Oh, so it looks like the "snapshot" was rigged and not an actual true account of Ventra reality. Now that makes sense!